Note: Chosen 12 top BigCommerce apps in this list focus on improving conversion rates, push shoppers to checkout, and increase sales for BigCommerce stores. We do not include apps that support operational functions. 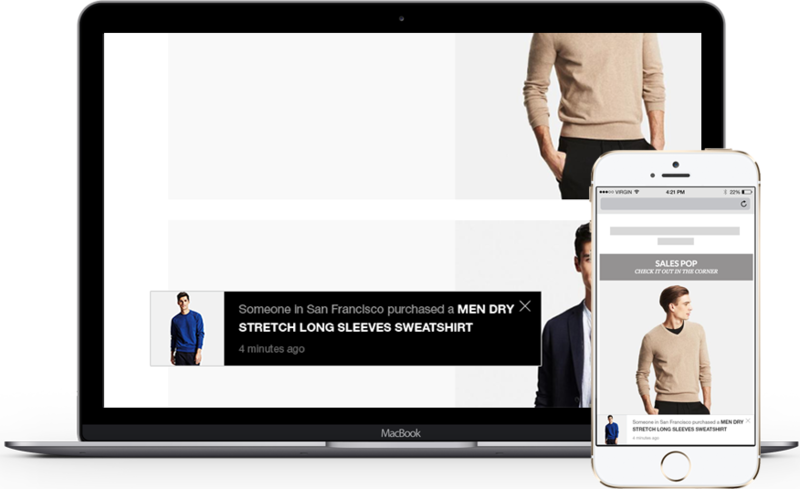 Besides BigCommerce’s built-in features, however, you still need assistance from third-party apps to take your store to the next level of automation and efficiency. But when it comes to finding the right add-on apps, it is nerve-racking and time-consuming. Too many apps that it can take you weeks to try, test and finally come up with the right ones for you. One minute cost to find a right app is a one minute wasted when you’re so busy handling your 9-to-5 job and your entrepreneur dream at the same time. We’ll save your time by doing the research, trying all the top BigCommerce apps on our test stores and contacting the developers for in-depth information. Now, let’s see what are the best BigCommerce apps in 2017 that you, if being a BigCommerce entrepreneur, should definitely pay attention to. P/S. Number #6 and #3 are unique apps that you cannot find substitutes in BigCommerce App Store. No coding skills needed, things are default at the best settings. Built from the concept of social proof enhancing buying confidence of online shoppers, Sales Pop app displays notifications of recent orders in your store to create the sense of a busy store. When a customer visits your website on any page, small popups on site corner will show up saying that someone from a specific location has just bought a product a few minutes ago. Buying showing the real name of the buyer, the real location he or she comes from, and the real time ago, this app builds trust and authenticity on your brand and encourage new customers to start placing orders with you. Developed by the creators of Sales & Orders: Management Software for Google Shopping, the leading, unified platform for retailers to create, manage, optimize, and analyze their Google Shopping campaigns, Google Shopping by Sales & Orders is the native, free Product Data Feed app for retailers looking to sell on Google Shopping. 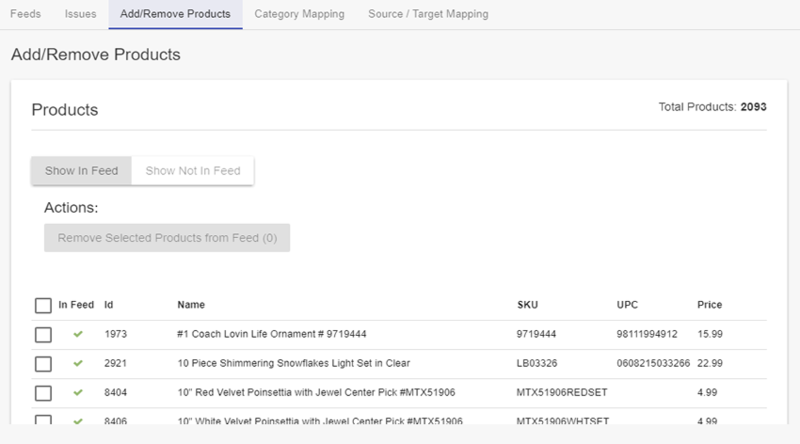 Out of the box, the app is a fully automated product feed generator and communicates directly with Google Merchant Center, sending the required data needed to be able to create Google Shopping campaigns in AdWords, and returns vital error diagnostics to assist retailers in improving data quality. BigCommerce merchants can also tap into optional, premium upgrade opportunities directly in-app such as Modify Products thus allowing them to optimize crucial data points such as Product Titles, Custom Labels, Descriptions, and more. Adding, editing, removing payment information are sometimes real hassles for online shoppers at checkout step, which can lead them to drop if the options are not easy enough for them. 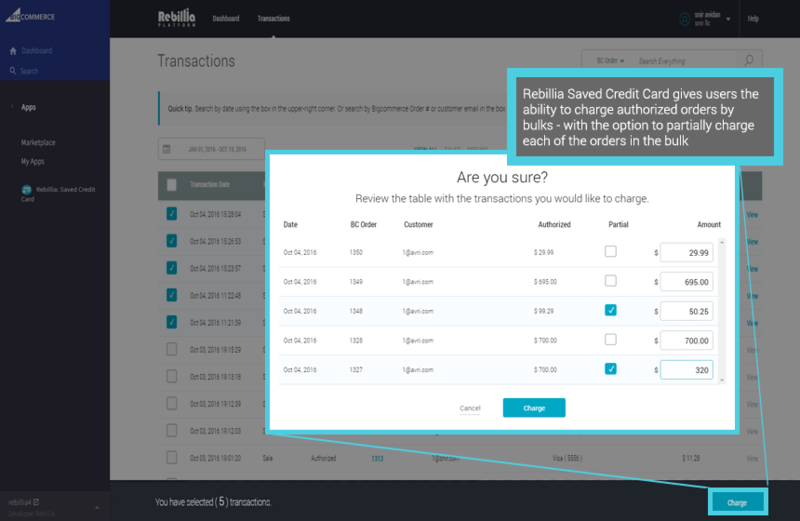 Rebilia is the best BigCommerce app that helps merchants solve this problem nicely. It allows shoppers to save their payment methods (currently support Authorize.NET, Braintree, Stripe, PayPal Payflow Pro, PayPal Payments Pro…) for future purchases. Shoppers can view, add, delete payment options on their account. You, as the store owners, can easily manage authorized transactions partially or in bulk in BigCommerce admin. More than 30 e-Commerce metrics in 1 dashboard, for example, Customer Lifetime Value, Repurchase Rate, Refunds, Customer Acquisition Costs, etc. Compass incorporate a comprehensive report of all your analytics metrics into a dashboard in your store admin. Instead of manually keeping track of metrics in Excel, you can now watch all metrics calculated for you by Compass in 1 dashboard. You can make bad business decisions due to the lack of contextual data. Compass gives you the benchmarks of your industry to help you make sense of your data. Though 100% precision is impossible, Compass crunches their huge pool of data to produce results closest to reality. Amazon dedicates 70% of its homepage to product recommendation widgets. Embracing this idea, the app builds highly advanced recommendation algorithms to tailor product recommendations based on customer’s behavior & interests on the store. 89% of online shoppers make a purchase based on reviews from past purchasers. Yotpo Reviews is a full-solution platform to help you generate reviews and curate those reviews into effective traffic and conversion drivers. Growing revenue for your online store goes with growing your email list and fan bases of your social accounts. 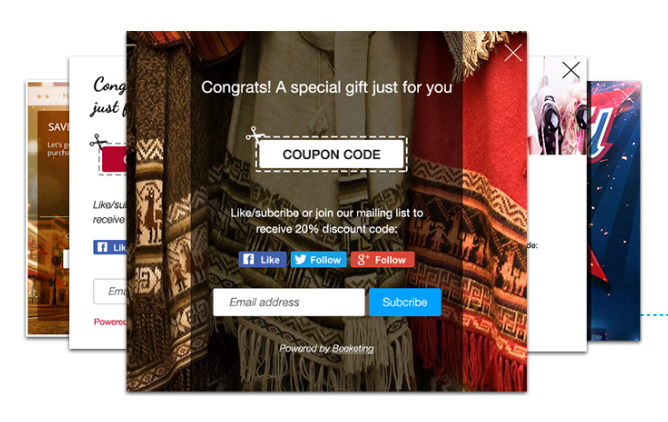 Better Coupon Box empowers catchy welcome popups that ask customers to follow social media or subscribe email in exchange for a coupon code on their first purchase. 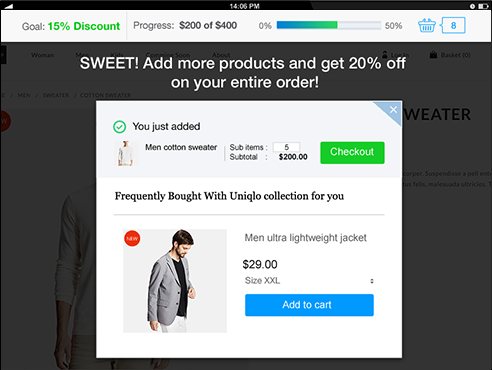 This is a brilliant idea how to use coupons to convert visitors into buyers for online stores, executed by the best BigCommerce app to build popups. There are many loyalty solutions for BigCommerce, but we think this is the top BigCommerce app. 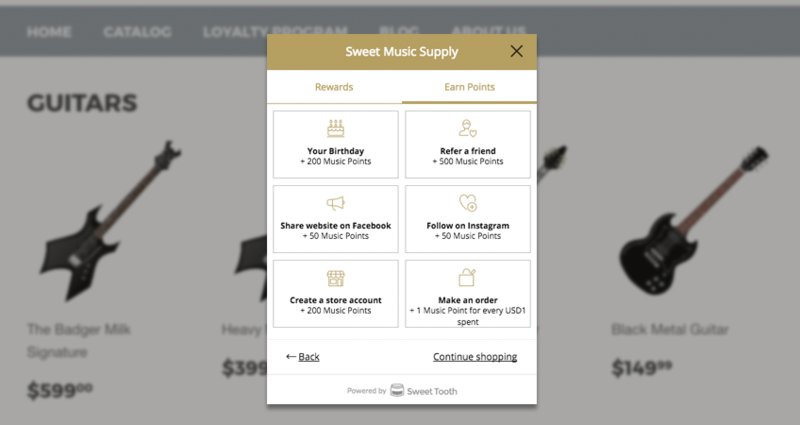 It helps you build a point-based loyalty program on your store. You can reward points to your customers if they take profitable actions on the site, such as purchases, referrals, account registrations, social shares, and more. You can decide what actions and how many points to reward on the app settings. Connect BigCommerce store with Walmart.com – among the largest marketplace of U.S. 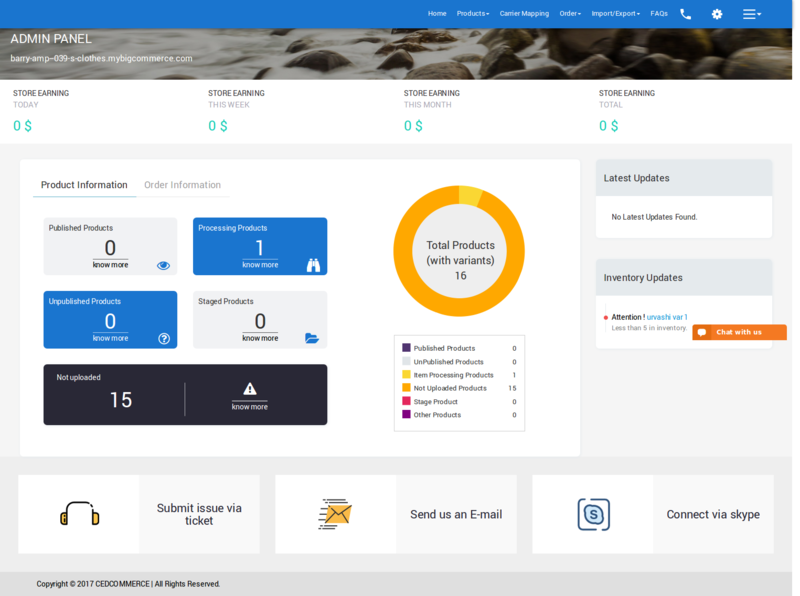 The Walmart Marketplace integration lets you connect Bigcommerce store with Walmart.com – among the largest marketplace of U.S.
Walmart Integration uses API communication mechanism to establish a seamless bond between the two platforms – BigCommerce and Walmart.com. This enables you to perform all the sales critical operations – items setup and management, inventory and order management, and pricing – from your store. Simply list your BigCommerce store products at Walmart.com and receive the orders at your store itself – no juggling multiple accounts. Aftership is one of the best BigCommerce apps in shipping management. In the app dashboard, you can track the status of all shipments, and view a detailed analytics report on shipments that are delivered, pending or overdue. 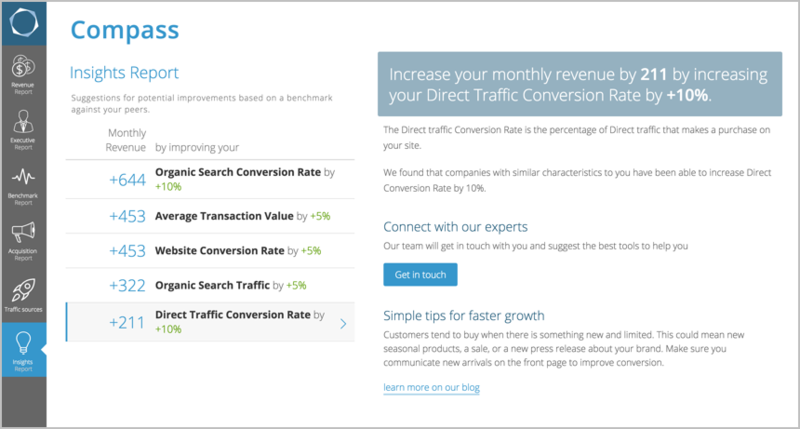 Detecting delivery exceptional trends in the report will help you take actions. The app also automatically sends out customized notifications to customers when a shipment is in transit, out for delivery, failed attempt, etc. For your customers, they can view the delivery status of their order in 1 click, and receive auto delivery notification right when the order is delivered. Built from the original idea of upselling and cross-selling tactics applied by Amazon and other big eCommerce sites in the work, Boost Sales app helps sell more to each customer, increase average order value by upselling and cross-selling relevant products they’re interested in. 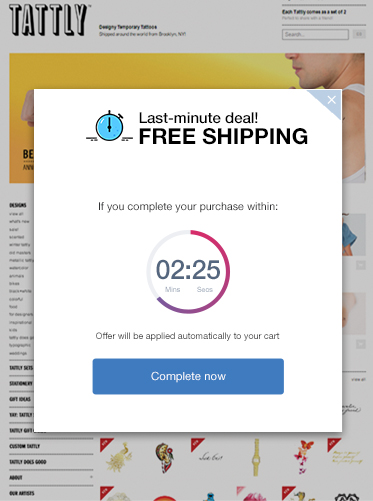 The offers show up in form of interactive popups. While product upsell alternates cart options with higher-priced items, cross-sell allows you to bundle complementary products into a combo and sell at a value price. Streamline order fulfillment with a centralized order management and shipping software. Once installed into your BigCommerce store, Sellbrite helps you list your inventory from one central catalog to several popular online marketplaces by bulk. When you sell on other marketplaces, central inventory will be automatically synced real-time to prevent overselling. When sales are made on each of the channels, the orders seamlessly flow into Sellbrite so you can print discounted shipping labels and ship all your orders from a single interface, or automatically route orders to Fulfillment by Amazon (FBA). With the last one, not only can you increase checkout rate but you can also get decent social referral traffic from your customers’ shares. You can see different types of offer you can create with Checkout Boost app here. Though BigCommerce includes some add-on features in their admin to help you promote deals on your store (Banners) and improve SEO rankings, the App Marketplace still has a lot of potential tools from third parties that can give you a strong boost in sales growth. Above are the top 10 best BigCommerce apps we’ve collected from our own research and testing. There is no “1 size fit all”, of course. Try ones that you feel like, keep testing and the numbers will tell you which ones work best for your business. Thanks for listing all these apps. BigCommerce is one of the leading platform for store management, and the task of Bigcommerce product upload is time consuming. Useful article! And personally, I would add social apps and forms to collect leads and feedback. 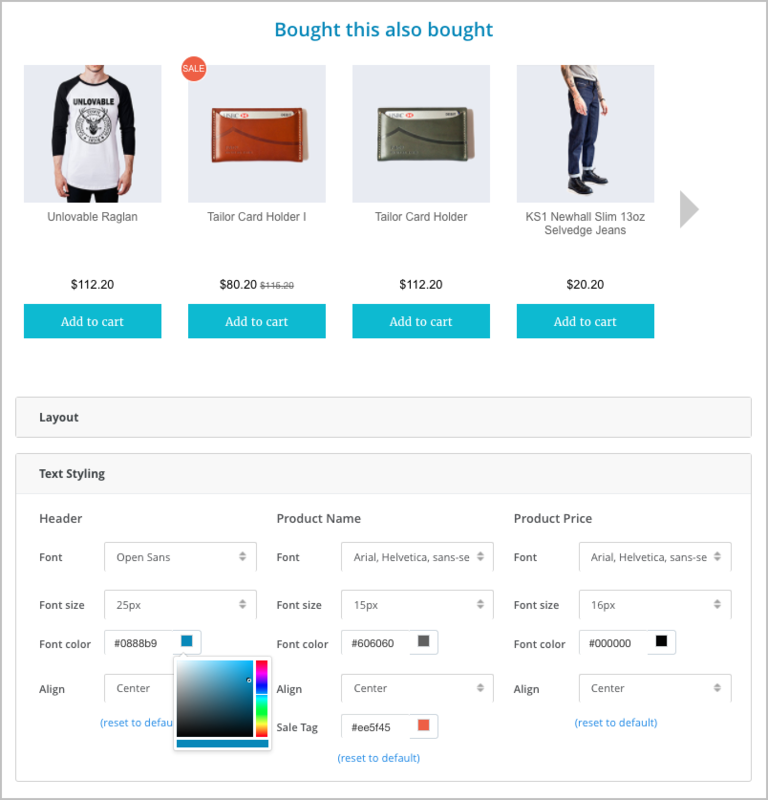 Here’s one of the collections of those: https://elfsight.com/bigcommerce-apps/ I use some of them on my website. Hello, great article, thanks! 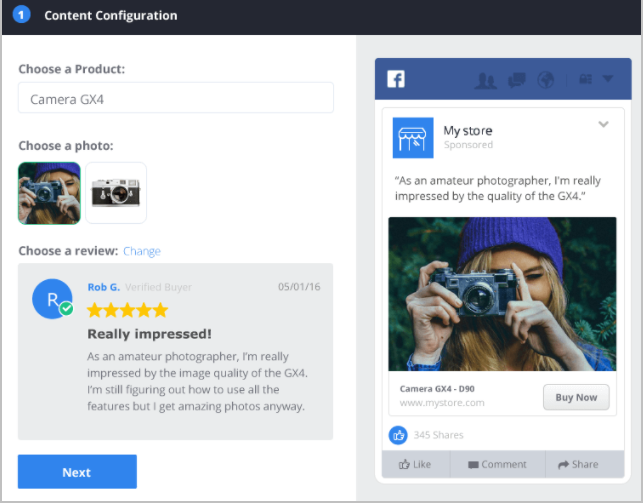 I for one, also enjoy using this plugin – https://elfsight.com/bigcommerce-apps/, you should give it a try.